One of the best things about Melbourne, apart from being one of the most liveable cities in the world, is the great talent of teachers and classes available in the performing arts and fitness industries. When on tour or holidays, it's always a challenge to find the same facilities in a new city and keep your fitness to the same level. To help other performers and fitness enthusiasts on save time in finding the best places to train Lauren from Limber Sports Performance has created a series of blogs for different cities in the world. We hope this helps and please feel free to get in touch if you have some other suggestions to add to the list. A beautiful spacious studio owned by Axel who is lovely and does reply to your emails should you have any questions (unlike many places in Germany. He runs group mat classes and private lessons but you could also potentially organise to rent the equipment during the early afternoons should you be trained to use it. Contact Axel directly for more information. Has a range of adult classes in the evenings and weekends. Juanjo Hinojosa does fantastic Jazz classes and he brings a great energy to the room. I also tried one of Claudia Senoner ballet classes and she was very welcoming and Ariane Brandt’s Modern class which I would call contemporary and this was also good. From memory as a performer visiting the city, it was 10 Euros per casual class. Is a beautiful studio with a lovely view of Stuttgart run by Toshiyuki Kusuda. A single class is 17 E or you can buy a 10 class pass and save a few euros. Try out the different teachers and see who you like. There was one amazing teacher on Saturday afternoons when I was there in late 2016 but unfortunately, I don’t know his name. The level of the morning classes is definitely professional level and more advanced compared to the other two schools I mentioned but it’s a great well-rounded workout. There was also a mat pilates class Monday mornings which was good, they call it body control. 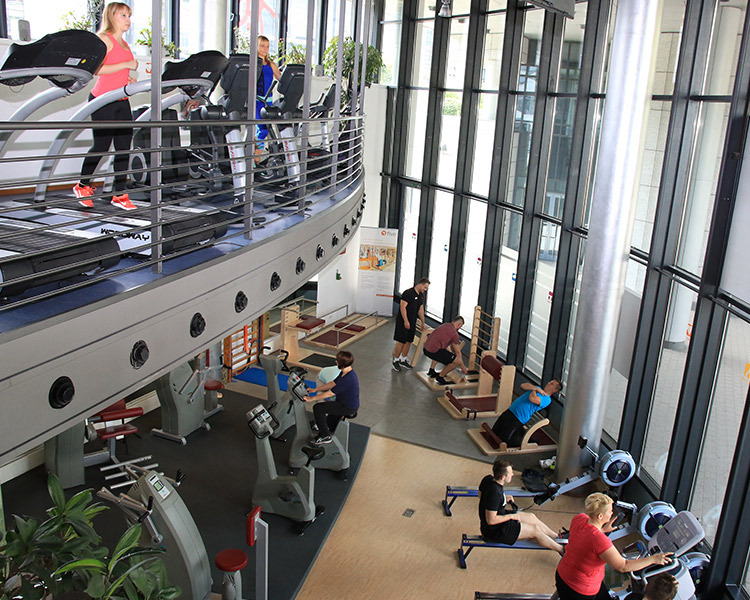 A very nice and spacious gym with two big separate rooms one for cardio machines and the other for weights. There are also two studio rooms which when they aren’t being used for classes they are great spaces for performers and dancers to train with mirrors. The studio downstairs also has a relatively high roof for practicing adagio or similar. I wouldn’t personally recommend the classes here for the style of training I need to do (perhaps with the exception of pilates although I haven’t tried it here) but the facilities of the gym are the best I have used whilst on tour. There are a few indoor swimming pools in Stuttgart. I went to Leo-Vetter-Bad which was close to where I was staying and didn’t get to busy so was perfect for me. It does have random opening times and it’s closed on Mondays so best to check the website before going. Also for tourists if you not want to get yelled at in German then only wear thongs or bare feet around the pool and leave your other shoes in the change rooms or you might get a rude shock. A single swim is 4.50 E and can be paid by debit card. And once all the hard work of the week is done you can’t go past visiting ….. The most luxurious wellness/baths complex I have ever been to. There is 7 different saunas, 8 different steam rooms, 8 different relaxation/rest areas, many beautiful pools, a man-made beach and a delicious restaurant buffet style and well as a beach bar. The only catch is you must be naked in all areas but as long as you are fine with that you will have a marvelous recovery day. I recommend hiring a robe for when you want to relax or go to the restaurant. Only 32.90 E all day on weekdays and an extra 3 E on Weekends and holidays. Definitely a 5-star experience!